Oki Islands are designated as Daisen-Oki national park and UNESCO Global Geopark with full of nature. 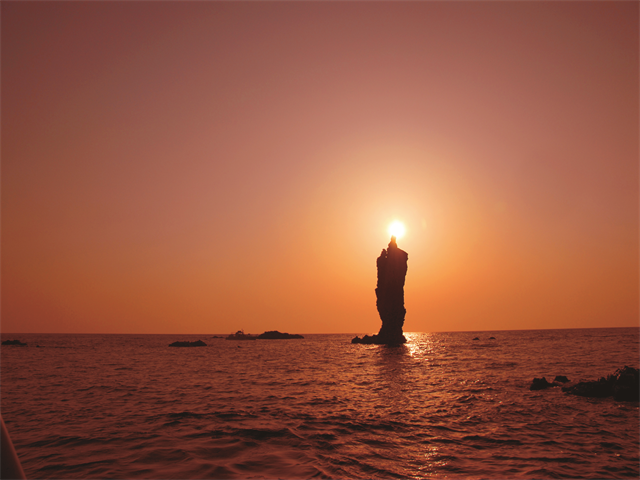 Candle Rock is the most photographed spot in Dogo and is called Rosoku-jima in Japanese. What makes it special is the spectacular view with setting sun. When the sun is setting and coming to the tip of the rock, it looks like a lit candle(see image). You can take the photo by taking a boat tour. The boats operate from either of two different ports, Fukuura or Akasaki depending on the situation. This boat tour is available from April to October and the departure time may vary according to sun set time. The boat tour takes about 1 hour and you can see numerous cliffs as well as sea caves. The captain is well-experienced and informs us the best time of the sun setting right on top of the rock.